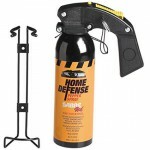 There are several reasons to use pepper spray as self defense and even for home protection. One of the best reasons is that pepper spray is extremely effective at flat out stopping an intruder or attacker. Unlike a firearm, pepper spray poses less risk of a fatality. When an attack happens, you have to act fast and make split second decisions. Having a gun is great, but we’ve all heard the stories about someone being shot because they were mistaken as an intruder, when in reality they were not a threat at all. Would you want to live with the fact that you killed or critically injured someone who was your family member or even a nosy neighbor? The use of pepper spray as the first line of defense can be an excellent alternative. Many people like the idea of having an effective weapon that even the cops use. If you have ever seen footage of anyone getting a face full of spray, you can almost feel their pain as you watch. Police units like the NYPD, Chicago, and US Marshalls use pepper spray in everyday patrols. Sprays that can reach up to 25 feet are the best… as the idea is to keep the intended target as far away as possible. One of the best brands out there is the Sabre brand. It has a 4 year shelf life and is very popular. I personally like the wall mount versions because I want it accessible in an emergency. Pepper spray is only one of many weapons you can use to protect yourself and your property. There are a ton of effective home/self protection tools out there. Leave a comment below and let me know what type of home protection you like to use or implement. This entry was posted in Uncategorized and tagged Home Defense, Pepper Spray, Protection, Self Defense, Weapons. Bookmark the permalink.